Just a short, enchanting stroll away from Augustusburg Palace in Brühl, Falkenlust is located on the edge of a secluded grove as the favourite hunting lodge of the Cologne elector and Archbishop Clemens August (1700-1761). 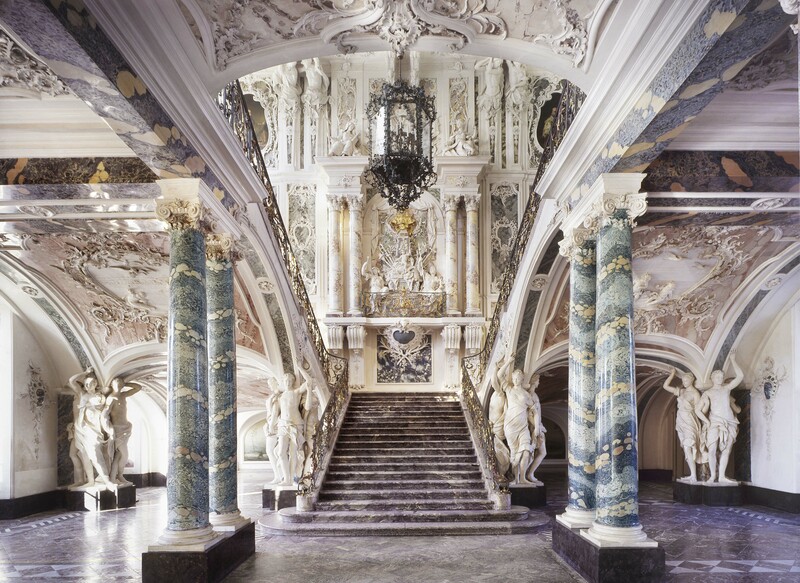 One of the most intimate and precious creations of German Rococo was built in a few short years (1729-1737) according to the plans of François de Cuvilliés, court architect of the Bavarian elector. The construction site was selected in accordance with the flight path of the herons, the favourite prey in falconry. En route from their breeding grounds in the Palace Garden at Brühl to their fishing grounds on the Rhine near Wesseling, the herons were captured by the avid falconer Clemens August and his hunting parties. Once the hunt was finished, the court would meet for dinner and entertainment in the lavishly appointed rooms of the hunting lodge Falkenlust. Characteristic of the perfectly preserved rooms are the sumptuously fashioned cabinets, already admired by the young Mozart in 1763. Since 1974, the state of North Rhine-Westphalia maintains the Hunting Lodge Falkenlust for the public as a museum. An exhibition in the auxiliary buildings portrays the art of falconry and displays the falconers’ life and workplace. In 1730 the construction of a chapel dedicated to Saint Mary of Egypt began in the immediate neighbourhood of the hunting lodge, which Pierre Laporterie fashioned as a much-admired grotto-style hermitage. UNESCO honoured history and present of the Hunting Lodge Falkenlust by inscribing it together with Augustusburg Palace and their gardens and parks on the World Heritage List in 1984.